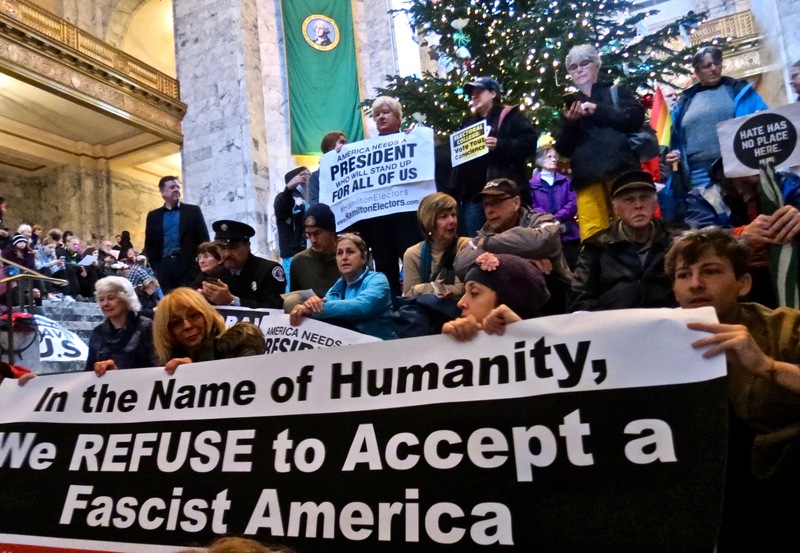 Last month concerned citizens rallied in Olympia in solidarity with protestors in fifty state capitals. We had hoped to convince electors to vote their conscience. In light of all that has passed since then, it seems naïve to have hoped they might step out of the party line. Those who lived through the rise of Hitler see history repeating itself. As a student of history, I looked back even further. When Trump bragged, “I could stand in the middle of 5th Avenue and shoot somebody and I wouldn’t lose voters,” I thought of the Latin phrase, agere et pati, ‘to act and to endure,’ a perfect description of medieval society. There’s a striking parallel between our current social order and that of the Middle Ages, in which the wealthy ruling class acted and peasants endured. Peasants made up ninety percent of the population. Lords squeezed serfs for taxes plus three days of unpaid work per week. The church exacted two more unpaid workdays, and a compulsory tithe, 10% of their income, forcing peasants to live hand to mouth. Nobility had the power of life and death over them, while the church tortured and executed dissenters. Protest was not an option. Traitors Gate, Tower of London. They go in, but they don’t come out. Like Trump and the GOP, the nobility and the church had their snits, but mostly they scratched each other’s back. Nobles gave financial support to the church, and the church justified the social order by declaring it God’s will that nobles should possess all the wealth and power, and God’s will that peasants and serfs should live to serve them. To cement the pact, the church placed highborn second sons into powerful positions in its own hierarchy. This artful deal resulted in feudal nobility with an iron grip on peasants, and peasants who were taught from birth to endure their sorry lot and wait obediently for their reward in Heaven. Nothing changed for centuries. It took the Black Death to upset the fruit basket. The plague hit Europe in 1347, killing half the population over the next five years. With the workforce so reduced, nobles hadn’t the manpower to till their fields or chase down runaway serfs. Surviving peasants finally had some choice about whom to work for, and could demand decent wages or leave, maybe even to learn a trade in the city. At last upward mobility was possible, and the middle class got a toehold in society. …King Richard II issued The Statute of Laborers, capping wages and forcing workers to accept the same miserable conditions they had labored under before the plague struck. The new law threatened severe punishment to serfs and peasants who dared seek better conditions or higher wages. It also forbad merchants and tradesmen to charge the market price for goods and services, and ordered a return to pre-plague prices. King Richard even tried to cut the only social security the poor had by forbidding beggars to beg. In other words, he wanted to make England great again. In an unprecedented protest, 60,000 peasants marched to London to demand an audience with the king. 2000 protestors died in the ensuing violence, and others did too, including the archbishop, the king’s treasurer, and a number of tax collectors. The peasants dispersed after the king made promises, which he broke, and granted pardons for the rebels, which he revoked. Rebels were hunted down and executed. 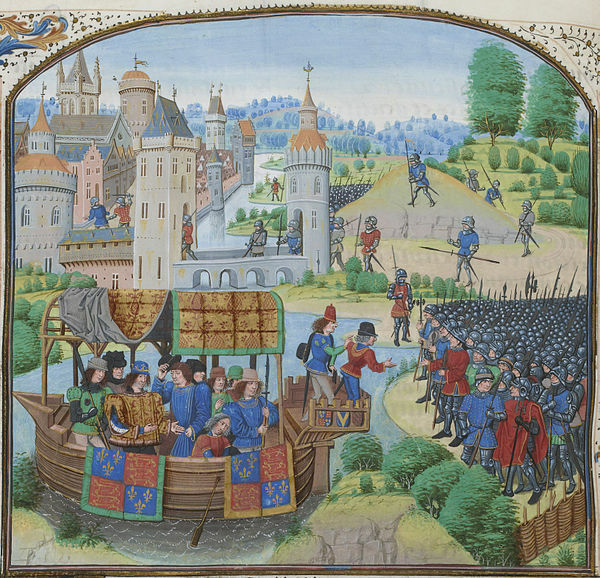 Richard II meets with rebels by Jean Froissant. After the dust settled, it might’ve seemed like nothing had changed, but historian Michael Postan says the revolt made history, “as a landmark in social development and a typical instance of working-class revolt against oppression.” If only for fear of another uprising, peasants were treated with more respect, the hated Poll Tax was never again raised, and it marked the end of feudalism. Most importantly, peasants set their sights on astonishing new, if distant goals; freedom, equality, and democracy. We face difficult days ahead. Our hard won democracy has deteriorated into an oligarchy—a nation ruled by a small elite group of the obscenely wealthy. Any power or constitutional rights we lose to Trump and the Republicans will be difficult to recover. In D.C., the House, the Senate, and the White House are controlled by Republicans. Trump hasn’t assumed office yet and they’re already ripping apart safeguards. We can’t afford to surrender to despair or even resignation. We must resist. Since the Peasants’ Revolt, we’ve had shining examples of nonviolent civil disobedience from heroines and heroes like Harriet Tubman, Mahatma Ghandi, Martin Luther King, Susan B. Anthony, Cesar Chavez, Lech Walesa, and the Standing Rock Lakota. Nonviolent movements like the Underground Railroad, the Women’s Suffrage Movement, the Civil Rights Movement, United Farm Workers, and the Dakota Access Pipeline Resistance have brought change that makes a difference in all our lives. Not without sacrifice, but with hope, courage, and determination. Harriet Tubman, civil rights activist, abolitionist, humanitarian. Solidarity in Communist Poland began with strikes to demand a free trade union, and resulted in freedom and democracy for the Polish people. There was the Velvet Revolution of Czechoslovakia. The Singing Revolution in Estonia, Latvia, and Lithuania began with people gathering to sing national songs forbidden by the Communists. Four years later they were independent nations, free of Soviet rule. Every protest matters. It’s an act of faith, almost a prayer. Not the kind in which you petition for a miracle or just a quick win. The kind that lends you strength to endure however long it takes, but also transforms you from silent sufferer to person of action. You’ll be there for those who have no voice, or who need help finding their own voice. You’ll be there to inform the public and to lift each other up, to remind yourself that you are not alone. Each act of resistance repays a debt to those who fought and sacrificed on a battlefield, in a courtroom, or on a picket line to make our lives better. And each act of resistance is a gift to our children and grandchildren. One day this will all be history. When people look back, and they always do, I hope to be remembered for fighting for what’s right. It’s time to call out the lies, write our congress, gather those signatures, and save our nation from a shameful demise. It’s time to put our boots on the ground.